COSLYS Organic Hair Mask protects and repairs deeply dry and damaged hair without weighing down. Its natural formula rich in French Cherry Plum Stone Oil and Organic Shea Butter nourishes and revitalizes breaking brittle hair, as it soothes dry scalp. 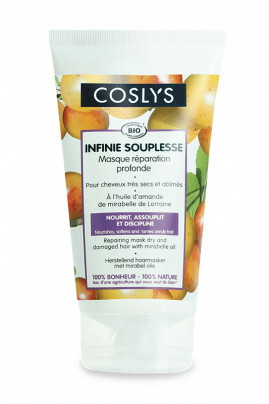 Coslys Organic Hair Mask leaves your hair smooth, shiny and easy to style with a 100% natural sunny fragrance ! Coslys has the ultimate hair care for healthy-looking strands ! After using Coslys Organic Shampoo with Plum Cherry, apply Coslys Organic Repairing Hair Mask to your hair focusing on the ends. Leave it for 2 to 5 minutes then rinse abundantly. Aqua (water), brassica alcohol (natural alcohol), cetyl alcohol (emulsifyer from coconut and glycerin), glycerin (natural glycerin), butyrospermum parkii (shea) butter* (organic shea butter), brassicyl isoleucinate esylate (natural cationic systems), dicaprylyl ether (emollient), aloe barbadensis leaf juice powder* (organic aloe vera extract), prunus insititia seed oil (cherry plum stone oil), linoleic acid (essential fatty acid from safflower oil), lauryl alcohol (emollient), sclerotium gum (gelling agent), arginine (conditioner), tocopherol (natural vitamin E), glycine soja (soybean) oil (non GMO soybean extract), linolenic acid (essential fatty acid from safflower oil), parfum (100% natural fragrance), benzyl alcohol, dehydroacetic acid (preservative agents), farnesol, benzyl salycilate, linalool (components naturally present in the fragrance).